It's summertime and the livin' is easy! 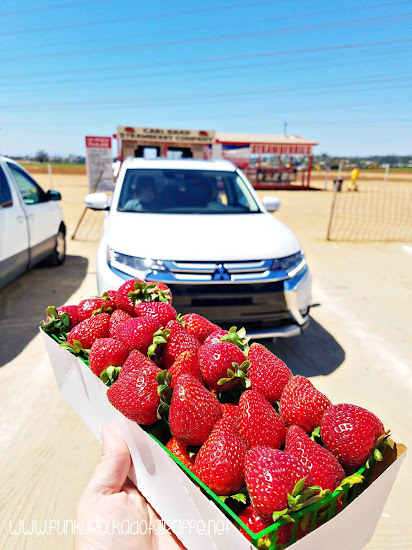 Especially when you have the 2018 Mitsubishi Outlander GT to drive and get around town in. Even though it's summer and we don't have the schedule of school and after school activities, we are still busy, busy, busy! 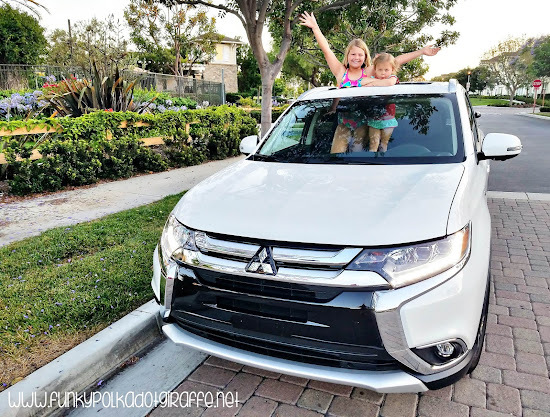 So I was excited for the chance to test drive the 2018 Mitsubishi Outlander GT for the week and try out all the great features it has to offer. 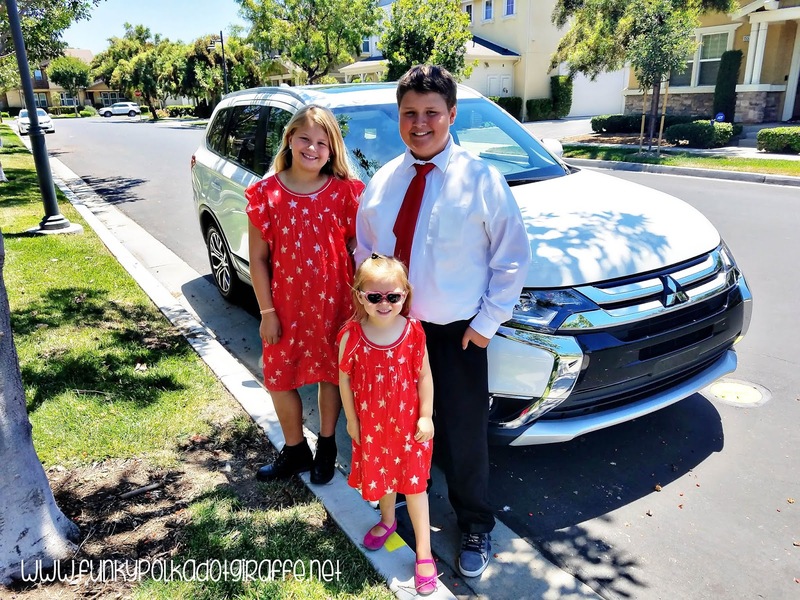 The kids were super excited when the Outlander was delivered and it was just in time for the Fourth of July holiday week. They thought it was super cool how the Diamond White Pearl exterior matched perfectly with our red, white, and blue motif for church that Sunday. I loved the heated, power side-view mirrors, power glass sunroof, and 18-inch two-tone alloy wheels. 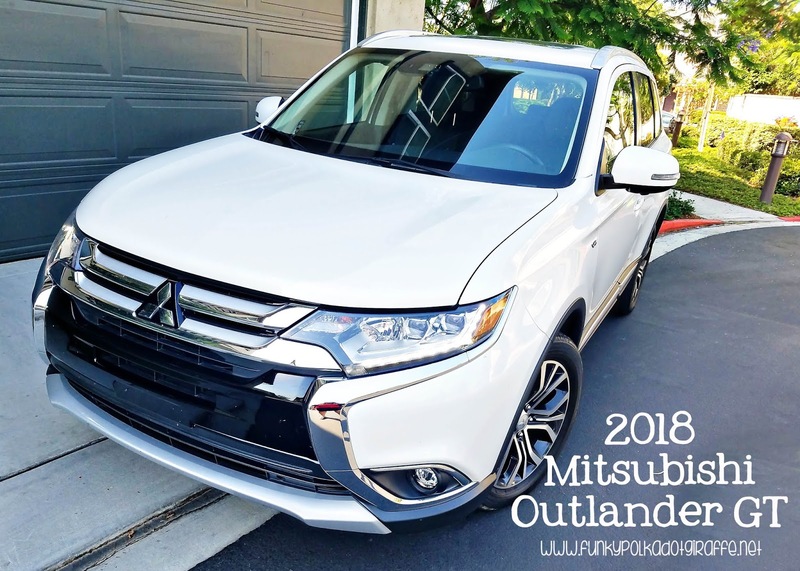 The power side-view mirrors are probably my favorite exterior feature of the 2018 Outlander. When you unlock the car, they fold out, and when you lock the car they fold in. This means no more dings and scratches on your side-view mirrors from other parked car doors or shopping carts trying to squeeze by in the parking lot. Now, because it's the middle of summer, I didn't need to use the heated feature on the side-view mirrors. But I know that it would really come in handy on frosty winter mornings here in Orange County. We drove the 2018 Mitsubishi Outlander GT down to Carlsbad to attend the ribbon cutting ceremony on the new LEGO City: Deep Sea Adventure Submarine ride at LEGOLAND and I appreciated all the safety features that kept us safe on our adventure. The Adaptive Cruise Control uses radar technology to help you maintain a safe driving distance from the vehicle in front of you. The Blind Spot Warning and Lane Change Assist alerted me when a vehicle was in my blind spot. That is so helpful when you are traveling on the freeway. And if you try to change lanes while someone is in your blind spot, then you get a three-beep warning to let you know to stay put until the car is gone. The Lane Departure Warning keeps you in your lane using an onboard camera and warns you audibly and visually if you are leaving your lane unintentionally. Let's talk about the cargo space! The 2018 Outlander GT is a seven passenger vehicle when the third row of seats is up. However, when you need space for stuff and not for people, the Outlander has you covered! 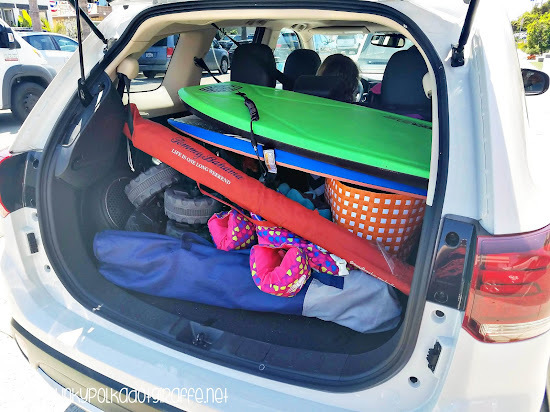 It is easy peasy to put the third row of seats down and then you have plenty of space (63.3 cubic feet to be exact) for everything you need for a day at the beach. We had a wagon, two chairs, an umbrella, two boogie boards, beach bag, towels, and puddle jumper in there and it all fit with no problem. 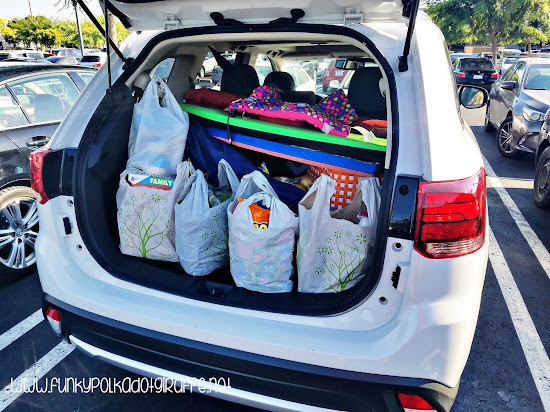 Then we had some quick grocery shopping to do after the beach and the groceries all fit along with all of our beach supplies. The back seat is a 50/50 split, so you can seat a 6th person and still have some extra room for cargo. It came in especially handy when all five us were in the Outlander because all three kids didn't want to sit next to one another on the middle bench. So, we would 50/50 the third row and Isabella would sit back there and the stroller would still fit next to her. We also love the power glass sunroof with sunshade and tilt feature! It makes trips to the pool for evening swims a lot of fun. It has been really hot here during the day, but the evenings are a great time to open up and enjoy the cooler evening air with the sunroof. 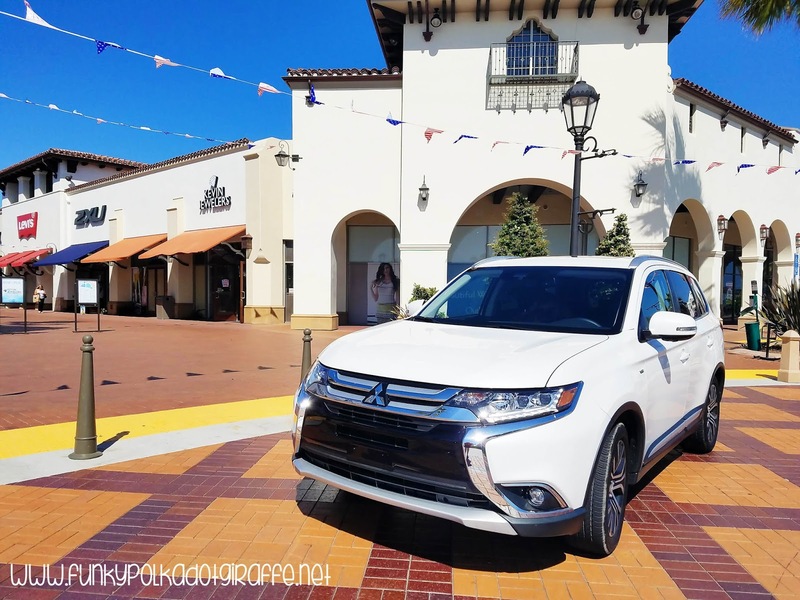 We loved driving around in the 2018 Outlander. It handles well and even though it seats seven, I feel like the exterior design is sleek and doesn't look bulky. It was the perfect size for our family of five and I'd recommend it for a families of 3-6 also.